You saw this already but I love it so much to not dedicate a post to it. Made from Amy Butler’s Moon Dots which I purchased from Skye Reve Fabric (thanks Natasha!) 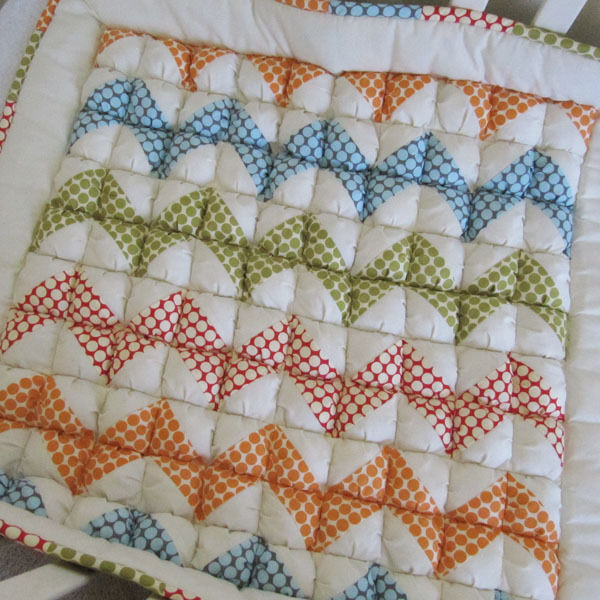 I had this vision for a zig zag puff quilt once I saw this zig zag quilt from Red Pepper Quilts. I also knew that I wanted to use the Tangerine Moon Dots print, but when I saw the other Moon Dots I wanted them in there too. Just a simple choice of fabrics and bam! Magic. Seriously…magic. I am in LOVE with this quilt. Wanna know something? 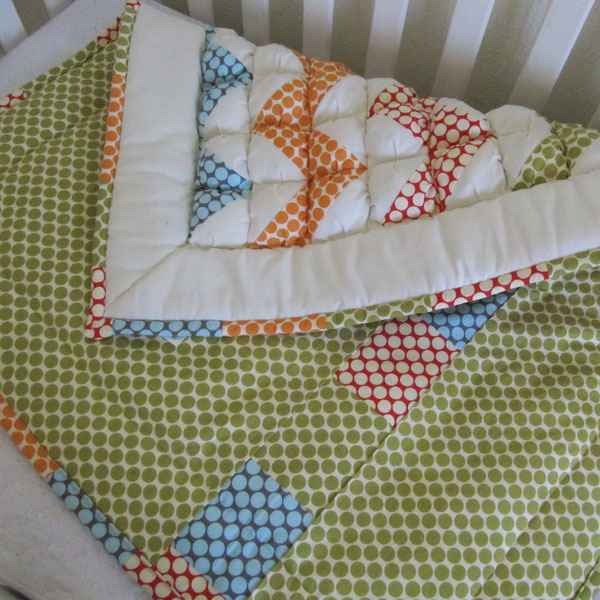 I have made dozens of puff quilts but have never kept one for myself. I feel…selfish doing it. Like I’m not really going to enjoy it as much as someone else could or something. But once I finished this quilt, I just stared at it for hours. I kept going back into the room to sneak a peek at it over and over again. I love how gender neutral it is, but yet if you have a boy it would be so BOY but if you had a girl it would become so GIRLY too. Now for the bad news. I’m keeping it. I was going to give it away next week on Tatertots and Jello, but nope, I can’t part with it. But if you want one to love as much as I do, you can purchase it in my shop. As for my giveaway…I’m making another quilt that I’ve been designing in my head for a long time. It’s clean and simple, yet customizable and I hope you love it. Love those dots and putting them in ziggy pattern is wonderful! I'd keep it too. How long does it take you to make a quilt like that? I've never made a quilt before but i found your website and im IN LOVE with this style. So i think im definetly in for a fun challenge! I know what you mean by making stuff and never keeping anything for yourself…im the SAME way! (check out http://www.etsy.com/shop/jewels18) i just get more enjoyment of giving it to someone and seeing them enjoy it! (but i don't blame you for keeping this one its ADORABLE!! I love all of your puff quilts. This one is so fun! I love that it can be for a girl or a boy. I love this! Just so beautiful and puffy! 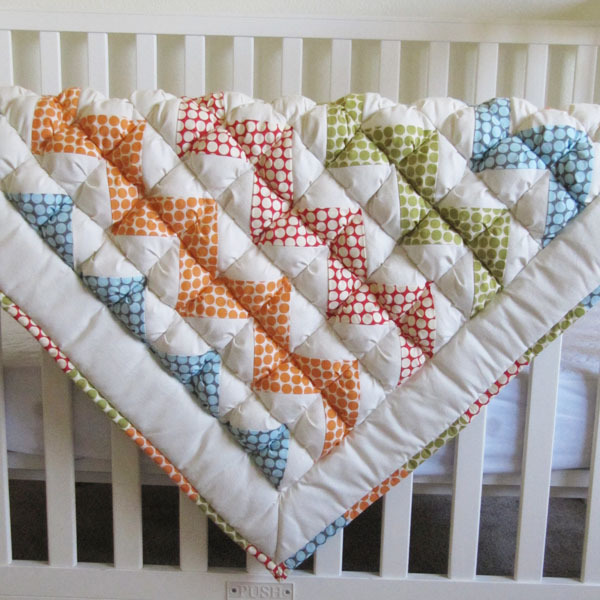 I am in love with this quilt too! It's so cute and the colors are fantastic. Great choices on the fabrics!